Daemon the ChiBo at 2 years old—"I can't imagine a more perfect dog than our little hybrid Boston Terrier / Chihuahua mix (ChiBo). Daemon only wants to please us and obey. 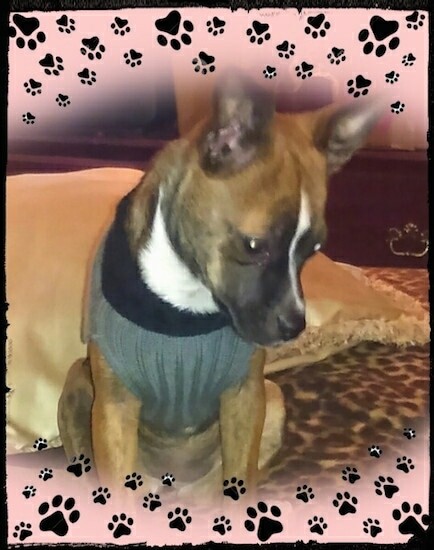 He is so smart and easily trained, although he did have a stubborn streak when it came to housetraining. He has never chewed up a single toy that wasn't his. He loves our 10-month-old baby and doesn't lick him or chew on the baby’s toys; he knows the difference. He plays well with other dogs and cats and strangers. When strangers see him for the first time they think he is a puppy Boxer. 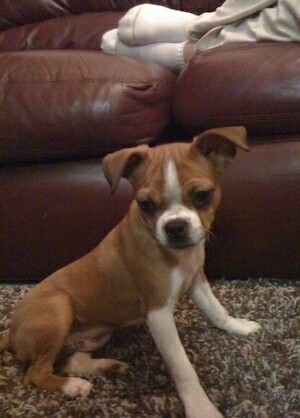 He has more of the traits of a Boston Terrier than a Chihuahua. He very rarely barks; in fact he barks less than my Akita who doesn't bark by nature. When he does bark it is because a stranger is walking directly behind our fence or trying to hang a flyer on our door knob. He is energetic and loves to play and run but if I'm watching TV he only wants to be in my lap. 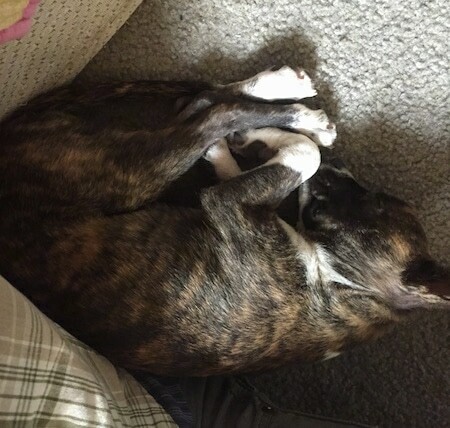 If I'm on the computer he is at my feet. I wish I had another one just like him." The Boston Huahua is not a purebred dog. 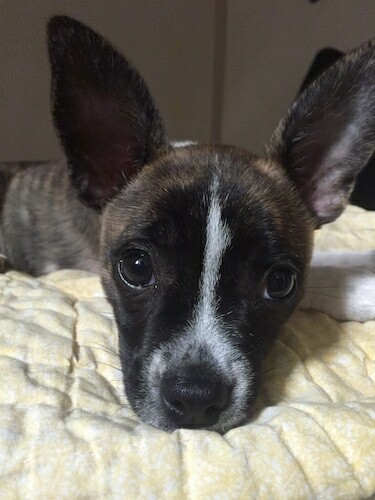 It is a cross between the Boston Terrier and the Chihuahua. The best way to determine the temperament of a mixed breed is to look up all breeds in the cross and know you can get any combination of any of the characteristics found in either breed. Not all of these designer hybrid dogs being bred are 50% purebred to 50% purebred. It is very common for breeders to breed multi-generation crosses. 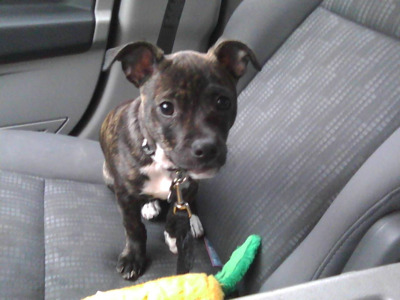 This is Darla at about 12 weeks old. "Her mother was a 16-lb. 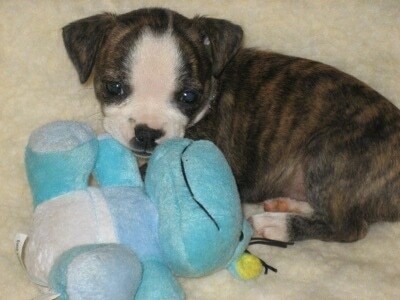 Boston Bull Terrier and her father was a 7-lb. longhaired Chihuahua. She is really very smart. 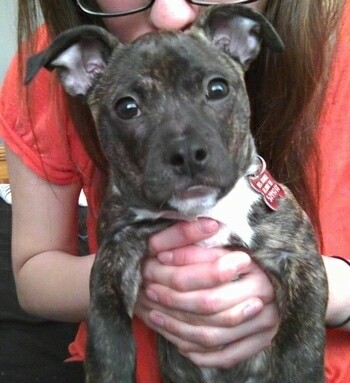 At just 12 weeks she was totally potty trained to go outside; she can sit, lie down, shake (with both paws) and roll over. The only thing she really can't do is walk on a leash!!! I guess it's because she's so tiny; she's used to being carried around everywhere." 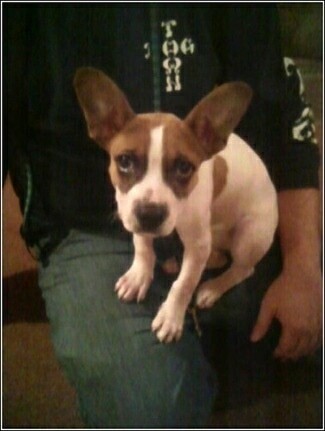 This is Darla, the Boston Bull Terrier / Chihuahua hybrid at about 12 weeks old. 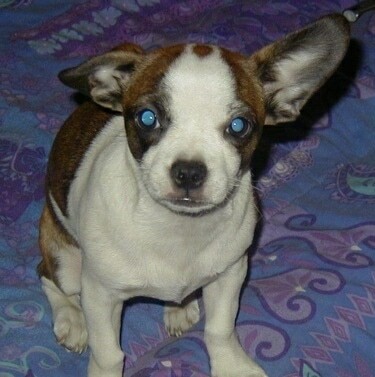 This is Darla, the Boston Bull Terrier / Chihuahua hybrid at about 5 weeks old. 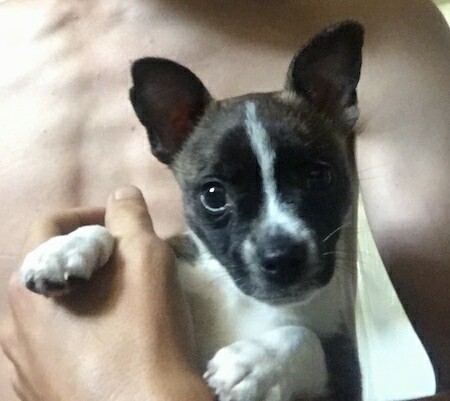 "Borat is a Bo-Chi and was given to my fiancé and me by a friend who was going to give him up for adoption. 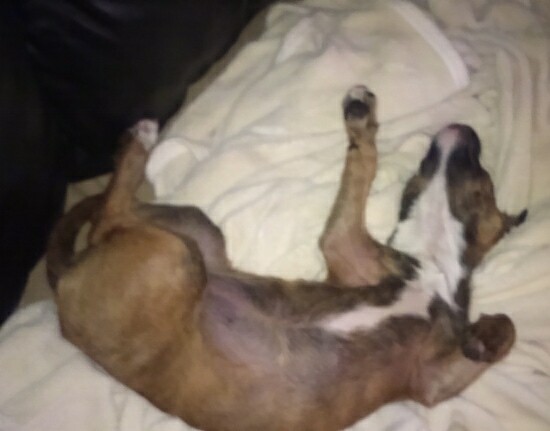 He was 14 weeks old at the time. He is 10.6 lbs. now and is expected to be between 15-20 lbs. full grown. He is a very well-behaved puppy, very playful and is very intelligent. He has taken to housetraining rather quickly, with accidents few and far between. He is extremely affectionate and loves to be cuddled. He is great around small children, other dogs and strangers. He has not been introduced to cats so we don't know how that would go. He has already proved himself a good watchdog and is very alert to people outside our apartment door; he alerts us but does not bark excessively." "This is a picture of Leo. 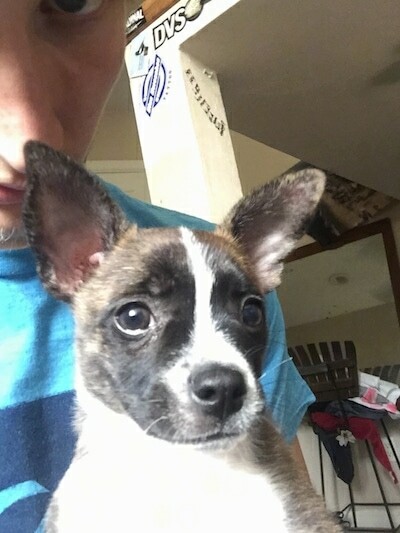 He is a three-month-old Boston Terrier Chihuahua mix. The father is the Boston. His temperament is very laid back, alert, loyal (he loves me to death). So far he seems to be exceptionally intelligent. He seems a little more Boston in temperament. He rarely barks. Maybe 1 bark to let me know someone's at the door. He loves other dogs and is fine around other animals. He doesn't like to be left alone but he's still learning. I have had him for two weeks and I'm finding it rather easy to train him. He is so sweet and loving. Many people have asked me where to get a dog like him. He weighs about 10 lbs. now and is about 14 inches long without his tail. To be honest I have been amazed how well he behaves and he's just a puppy. He's a fantastic companion. He'll go anywhere with you and loves the car. Even when other dogs bark at him he stays quiet." 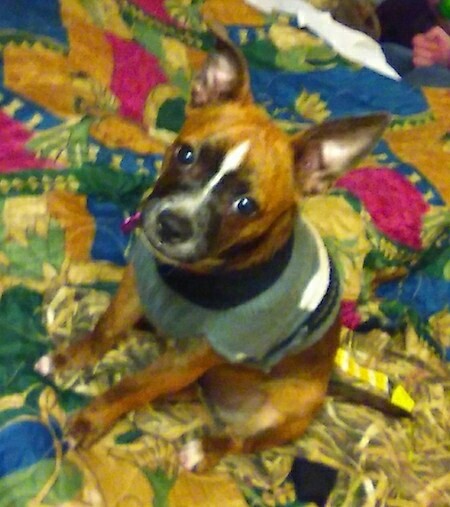 Lucy Loo the Boston Huahua hybrid (Boston Terrier and Chihuahua mix) at 9 months old wearing a shirt—"Lucy Loo is a Bo Chi. I got Lucy through a friend of mine and I could not ask for a better dog. 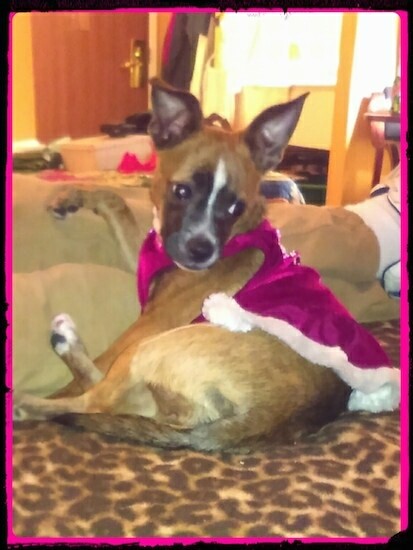 Well I say dog, Lucy is not a dog she is my friend my companion my baby. She is the funniest thing I have ever seen. She has more energy than 2 toddlers. When she's outside she runs circles around me just as fast as she can run and loves to play fetch. When she brings the toy back she teases me with it. If I act like I'm ignoring her she will either lay the toy in my lap or nudge me with her nose. Lucy is just so likeable. Everybody she comes in contact with falls in love with her. I'm lucky to have Lucy Loo in my life." 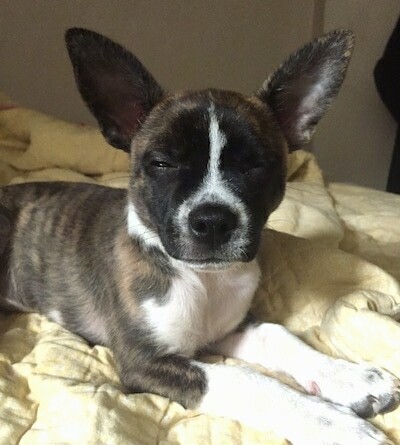 Bo the Boston Huahua hybrid puppy (Boston Terrier and Chihuahua)—"At one year old he is very loving and smart. He is thoughtful; he will put a toy in the bed with the cat, and then get one for himself to play with. He is full of energy, but if you want to sit all day, he will stay by your side. Bo is a funny little guy who fits right into our lives. He is such a good dog. We love him very much." 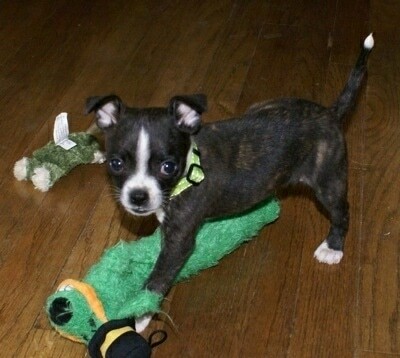 Keller the Bochi Boston Terrier Chihuahua mix as a puppy at 4 months old—"Keller is a Bochi. 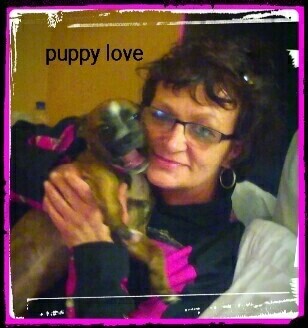 Her dad is the Boston Terrier and her mom the Chihuahua. She was the only puppy in the litter. She absolutely loves people, even strangers. She loves going on rides and playing with our small farm animals. Her favorite toy is her cow hoof and her ball. She could play catch for hours. Every night she cuddles up right beside me. My girlfriend can't stand it haha. She tells me all the time that the dog thinks she's my girlfriend."